We are excited about our Renovation that will be ongoing for the next few months! Come check out all the improvements we are making. 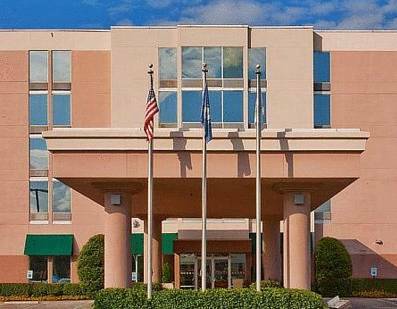 The Holiday Inn of Hopkinsville is located approximately two miles from Memorial Field Airport and 72 miles from Nashville International Airport. Local attractions include Trail of Tears Park, Tie Breaker Park, Pennyroyal Area Museum, Stadium of Champions, Jefferson Davis Monument, Fort Campbell Army Base and Don F. Pratt Museum. Our amenities include a 24-hour front desk, on-site restaurant and lounge, indoor pool, whirlpool, sauna, on-site fitness center, complimentary newspaper and parking, business center with fax/photocopying services, meeting/banquet facilities, guest laundry and dry cleaning/laundry pickup. Bring your animal friend along as we are a pet friendly hotel. We offer Free Wi-Fi throughout the entire hotel. The Holiday Inn of Hopkinsville is the only full service hotel in our market area. We are ready to offer quality products and outstanding service. The Legends is located in the lobby of the hotel. It is equipped to view the latest televised sports events and offers a relaxed atmosphere to enjoy after hours cocktails with colleages. Frank Sutton played the Marine sergeant who always yelled at Gomer Pyle. His hometown immortalized him with a bronze statue in his familiar pose.